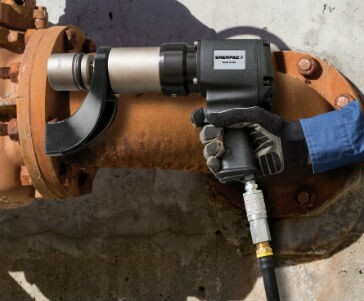 With a unique, low-friction planetary gearbox design, the PTW-Series tools extend equipment uptime with minimal wear in even the harshest environments. This low-vibration design also reduces operator fatigue and risk of injury. Configured with a quiet air-controlled motor, the PTW-Series tools ensure continuous performance without disruption in both indoor and outdoor applications. The PTW-Series tools provide simple operation with an easy-to-operate, trigger style handle with quickly accessible tightening and loosening control, which eliminates the dangers of manual tightening. These ready-to-use tools also come with a Filter-Regulator-Lubricator (FRL) to ensure operators have all necessary components to utilize the wrench. To accommodate diverse application requirements, the PTW-Series tools are available with a wide assortment of custom arms and accessories, including nose extensions for wheel bolts on off-road vehicles, reaction arms for deep sockets and sliding arms for variable bolt pitches. Arms are also available in various lengths. All PTW-Series pneumatic torque wrenches are CE declared and are shipped complete with a unique calibration certificate, helping to ensure complete, verified accuracy.